Slice them, burn them, skewer them, and launch them - no matter how you get it done, orcs must die in this fantasy team action tower defense game from Robot Entertainment. 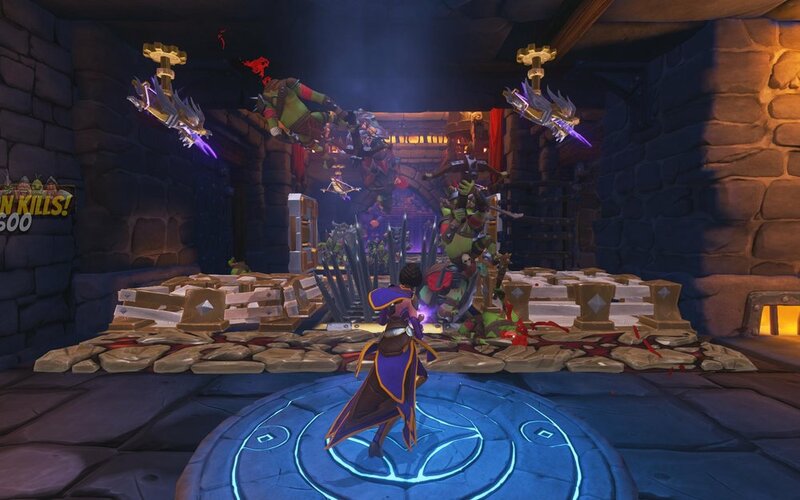 Play as the powerful War Mage, magical Sorceress, or brutal Blackpaw. Unlock a lineup of other awesome heroes, each with unique powers and abilities. Go at it alone or in teams of three. Whatever you do, just don’t let those ugly, greedy, vicious green guys into your Rift! Battle your enemies across multiple modes and difficulty levels. Will you roast orcs in pits of lava, pound them flat with ceiling traps, or freeze and shatter them with a slash? No matter the weapons and traps you choose, you’re sure to have an orc-killing blast! Killin' Orcs and Smashin' Dorks – Orcs Must Die! Unchained's white-knuckle witch's brew of action and strategy lets you team up with your friends to lay waste to millions of invading monsters! Build an impenetrable gauntlet of traps to hack, grind, flatten, gibletize and incinerate your foes, and unleash your own minions to charge into the heart of the enemy rift! Don't Let Them Through – Orcs take points off your scoreboard, and you don't want that! 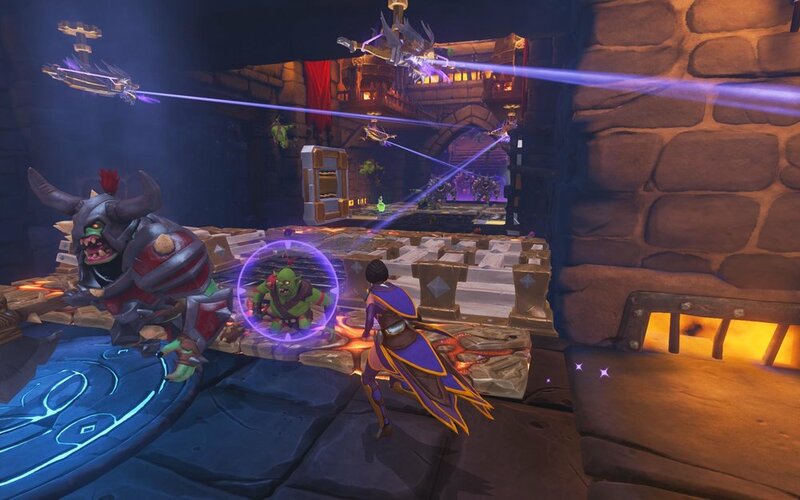 If you plan to emerge from the giblet pile victorious, your team will need to masterfully wield your traps, weapons, and abilities in a frantic game of minion tug-of-war. Any orcs that slip by unscathed will teleport through the rifts and on to victory! It's Definitely a Trap – The only thing better than building traps for murdering minions is building more traps! Play to unlock and upgrade traps. Cover your fortress keeps in gleeful torture devices and engineer a variety of hilarious and violent ends for invading minions. Customize your strategy for every battle. The hordes are no match for the powers of elements and physics! 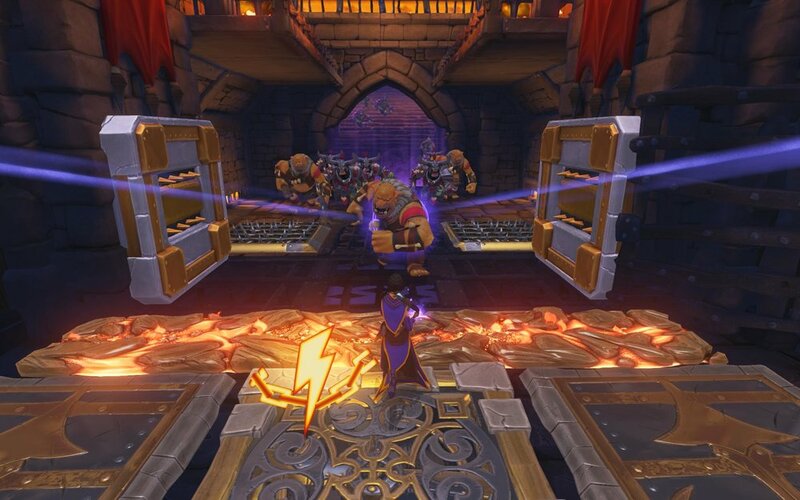 Real Action Heroes – Are you mage enough to defend the rifts? Dozens of unique and powerful heroes with deep gameplay options offer a plethora of painfully creative ways to stop orcs in their grimy tracks. Whether you prefer might and majesty or scum and villainy, there's a hero for every type of orc-slayer around. Survival or Sabotage? – Once you've built your skills in Survival mode, bring them over to Sabotage mode and go head-to-head against other teams! While your team defends its rift, another team is playing on the same map in some… spooky… alternate dimension or something. They can distract your team with spells, minions, and huge bosses to make you lose rift points. But of course, you can pay 'em back by doing the same! The team with the most rift points at the end of the match wins.